There's a saying in Brooklyn that if you come from my part of town, that you're from around the way. Well Lyric, Juicy, and Precious are all from around the way. They all live in Crown Heights, one of the most notorious sections of Brooklyn, but to them it's just a place they call home. 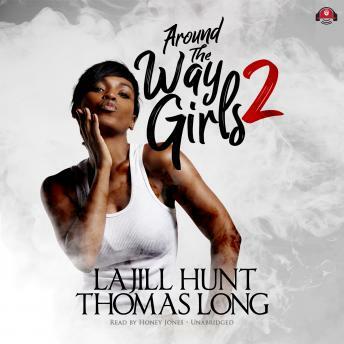 Around the Way Girls 2 is a fast-paced look at the life of some street smart women who think they know it all, but are about to get the lesson of their lives.Lyric Crenshaw has been playing the game so long she's mastered it. Her motto has always been to use what you got to get what you want. With a face and a body like hers, the possibilities are endless. But when a love struck co-worker teaches her otherwise and she meets a man that sees right through her, she may have to open her eyes and see that winning the game ain't everything. If Juicy Brown were to die today, her obituary would read, another welfare recipient bites the dust. But things have to change. She agrees with some of the rumors around the neighborhood about her, but one is straight scandalous! And she's about to clear it up by any means necessary. Precious Paine is a ghetto jewel haunted by memories of a troubled childhood. Her and her crew have the game on smash, but trouble lurks around the corner. Can the love of a good man make Precious leave behind her hustles in the streets or will she become another victim of the inner-city life that's marked for self-destruction.